Exodus 9:8- And the LORD said unto Moses and unto Aaron, Take to you handfuls of ashes of the furnace, and let Moses sprinkle it toward the heaven in the sight of Pharaoh. (Exodus 9:9) And it shall become small dust in all the land of Egypt, and shall be a boil breaking forth with blains upon man, and upon beast, throughout all the land of Egypt. I must confess it was a little hard to come up with a recipe that was not gross on this one. 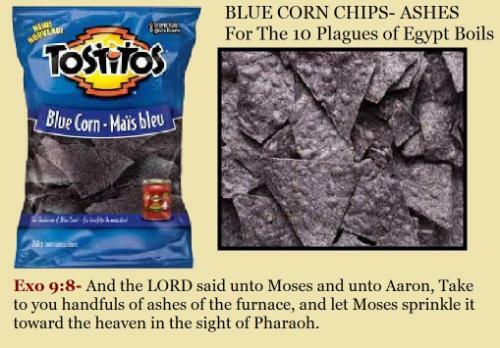 I thought of the blue corn chips and I thought they looked like ashes. Just put these in a bowl and add some cheese dip on top. You can add some other mixed chips in with this to give it that ashes effect. Teach the kids the lesson on the boils and tell them how Aaron and Moses sprinkled ashes into the air. I try my best to come up with a snack that coordinates with each lesson. Kids remember a lot when you teach with food.